I started work on Monday, rather unexpectedly and, although I had asked permission to continue writing my blog, just two days in the office has been enough for me to realise that it would be stunningly inappropriate to continue writing about my life when it is so intimately connected with the fashion industry. Going on, at som epoint in the future I will start up a new anony-blog which will talk about stuff entirely unconnected with work in any way. No fashion, design, beauty, or style. It'll be the other things I love doing that have nothing whatsoever to do with being a fashion & style editor, like going to ball games, cooking or sitting in the park. I'm not publicising it, but I hope some of you may stumble across it and enjoy that too in the future. I'm also not going to be commenting on fashion blogs under Liberty Girl either as too many people know who I am, and I don't want my personal take on things to be confused with professional opinion. Thank you all so very, very much for reading. 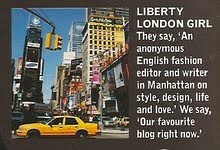 I'm thrilled to have been part of the fashion blog world.